At a public meeting on Wednesday, South Lake Tahoe city staff gathered input from residents on proposed changes to Herbert Avenue. Though construction of Bijou Marketplace just kicked off this summer, the so-called “Whole Foods effect” is already beginning. Mike McKeen, owner of the neighboring shopping complex on Herbert Avenue that houses Sugar Pine Bakery and Los Mexicanos Restaurant, has put the building up for sale — but if he doesn’t get a suitable offer, he has plans to redevelop. 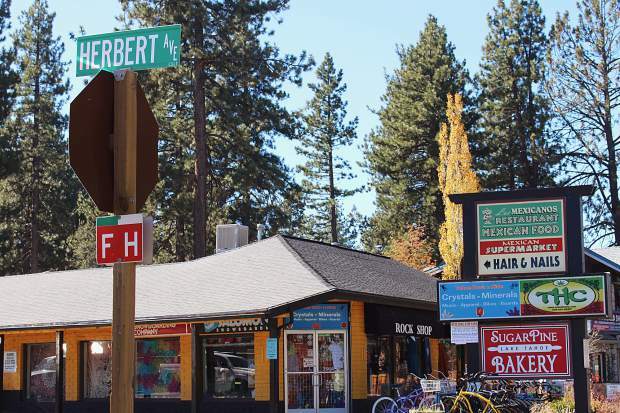 At a public meeting on Wednesday, Oct. 25, South Lake Tahoe city staff gathered input from residents on changes to Herbert Avenue brought forward by McKeen. McKeen’s property stands to lose a portion of its 19 parking spots when the street is brought up to code as part of the Bijou Marketplace development. With increased traffic turning off of U.S. 50 to access Bijou Marketplace, it is no longer safe to have cars reversing out of parking spots directly onto Herbert Avenue, said city manager Nancy Kerry. The perpendicular parking spots would have to be removed and re-lined for parallel parking. In an idea put to the city, McKeen proposed closing Herbert Avenue where the commercial development ends and the residential neighborhood starts. At the public meeting, a traffic engineer presented the impacts this would have on traffic flow and volume, as well as car and pedestrian safety. The study also looked at the impacts of making Herbert Avenue one-way. Though the one-way option had a lengthy list of cons, the traffic study found that the closure of Herbert Avenue would have a positive impact on safety while maintaining parking for McKeen’s commercial tenants. Though traffic would slightly increase on the neighborhood roads, the overall volume would remain below the threshold for residential streets. The audience was split on this idea. Many expressed concern about increased traffic in neighborhoods and the extra drive time it would take to access U.S. 50. Tenants from McKeen’s property were adamant that a loss in storefront parking would result in a decline in business. Bijou Marketplace, however, will bring in an additional 140 parking spaces. Kerry said these proposed changes to Herbert Avenue are just ideas that are being explored; the purpose of the meeting was only to gauge public opinion. Any changes to the road would require extensive review and public input.